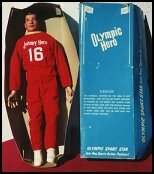 Johnny Hero was a 13 inch figure made by Rosko Industries for Sears in 1965 as an alternative to GI Joe. He disappeared a few years after as apparently an alternative was not required. He was repackaged briefly (probably to dump unsold stock) as an Olympic Hero. Johnny came with a red number 16 shirt, gold shorts, socks and white tennis shoes. His body was a heavy foam with plastic hands and head. He had a metal prong in his hand that helped him hold a baseball or football. Once you bought your basic Johnny you could then buy accessory sets from your favorite baseball and football teams. It is not unusual to find later sets with mixed accessories. You may find a Vikings helmet with Redskins pants and an Eagles jersy. One of the problems with this line was getting the helmets and clothes off on and off of the figures. The foam rubber would tear easily and the helmet was nearly impossible to get on without cracking it or scraping Johnny's ears. This means that loose figures in nice shape are a rarity. That short production run also means that these boys are hard to find. Just a few years ago, you could find Johnny Hero MIB for under $50 and equipment sets for under $10. Now boxed figures regularly sell for $75-$125 and equipment sets for $25+.